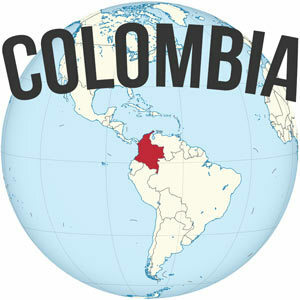 Long before I set out traveling the world, back when I was still slaving away at a desk job, I spent a lot of time reading financial literacy books and a number of personal finance blogs so I could better manage my somewhat meager salary while living in one of the most expensive cities in the United States, Washington D.C. When I graduated college and started working I would not have considered myself very knowledgeable on these matters in general, but I did have a good example from both my Mom and Dad who were never the type of people to live far beyond their means, racking up excessive debt, or spending frivolously. But I could have easily fallen into the trappings of lifestyle inflation if I followed the lead of some of my colleagues… Rather it was thanks to my ongoing self-study in financial literacy that I kept living frugally and started building savings. What I was saving for, I wasn’t really sure. But it doesn’t matter whether you need to get out of debt, want to buy a house, save for retirement, or just save money to travel. The first and most important step is to educate yourself and become financially literate so you have the freedom to do what you want to do. When people say they want to be a millionaire, they don’t actually want a million dollar bills in the bank. They want the perceived freedom that all that money affords. There are many people who earn a huge paycheck but live month-to-month… Just look at doctors, pro athletes, or even actors. Then there are people with a meager income who have designer clothes, a McMansion, and a $75,000 luxury SUV, thanks to credit cards, massive bank loans, and generous leases. Neither of those two groups has real freedom, even if they have the accouterments of wealth. My goal with money is to buy freedom. Freedom of time, choice, decisions, etc. The following financial literacy books were fundamental in my world view and in my ability to achieve the freedom that I have today… They are how I said goodbye to the 9-to-5 and my boss at the age of 29. I would consider the below books to be essential reading for everyone. The best gift you could ever give yourself is to take a few months or so to read these books (and others), take the information that is most useful or applicable to you in the moment and adopt it. You can’t just read one book, wave a magic wand, and be done with it. With every book you read or even re-read a few years later, you will glean new information and a new perspective. So keep reading, stretch it far beyond a few months, make it a year-long pursuit or even better, a life long pursuit. Ramit Sethi is the brash sometimes abrasive author behind the popular personal finance blog, I Will Teach You to Be Rich, which is also the name of his New York Times best-selling book. 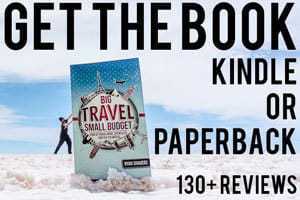 The book caters to a younger 20s or 30s audience, but it covers the fundamentals of taking control of your finances by eliminating bank fees, building savings, and so forth. Automate everything. Automate the amount of your money that goes to your savings account and investments every month when you get paid. Automate your credit card payments, cell phone bills, car payment, etc. By doing so, you free up mental space and avoid ever being charged late fees, etc. This is a mindset and lifestyle book as much as it is a money book. It will have you, of course, get out of debt and build savings, but it will also tackle consumerism, de-cluttering, minimalism, and basically realigning your life to actually live your life rather than simply staying on the rat race treadmill. It is more of a holistic approach about changing your entire relationship with money and spending, rather than simply telling you to put $x in an emergency fund and so forth. For this reason, it’s also probably one of the most challenging reads, because it will cause much introspection rather than providing you prescriptive answers. For instance, a real estate agent needing to drive a nice car for clients in order to demonstrate success since it would be alarming to see an agent drive up in an old beater. This could mean someone earning $40 an hour actually amounts to $20 per hour or even less. How much of your life energy are you trading to keep buying things? Dave Ramsey is the personal finance adviser to millions of Americans who has a strong appeal to middle America with his down to earth, folksy, and at-times religious perspective. 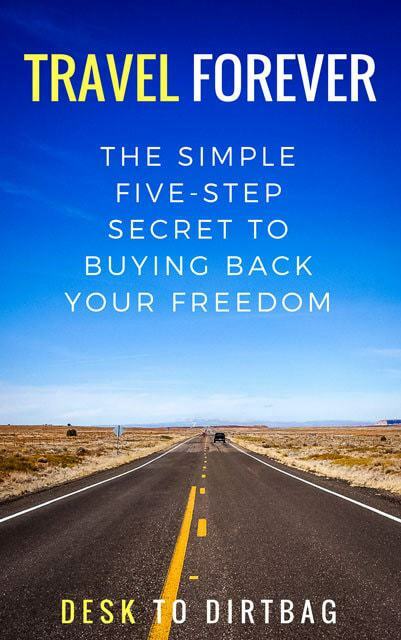 This is probably one of the best step-by-step books you can find in terms of getting out of debt and achieving a basic mastery of your money situation. The debt snowball and chopping away at your debt with an almost fanaticism, because by living like no one else now, you can live like no one else in the future. The debt snowball may not be mathematically the best approach to paying down your debt, but it may perhaps be the most effective in terms of human psychology when you are in need of a small win and feeling like you are finally taking control of your finances. Read more about the differences between the debt snowball and debt avalanche here. This book is perhaps one of the most famous out there, and although it is somewhat old now, I think there are some truly valuable bits of wisdom contained within. The book presents the (perhaps false) story of the mindset between the author’s Rich Dad and his Poor Dad, and how they approach life, employment, business, and money. Poor people tend to take on debt to buy consumer or luxury goods, whereas rich people take on debt in order to increase their monthly cash flow. Or, how I interpret it, it’s best to spend your money to be a creator of things rather than a consumer of things. Passive income is a game changer. Some people get hung up on details in any given book, which in this case is often on the real estate angle. I’m not advocating for that approach, nor would I recommend following up with any seminars they might offer. This is a great book to open your eyes to some of the common traits shared among many millionaires since they spent years interviewing them. There is a lot of great insights within these pages and as I mentioned earlier, the people who we might immediately associate with being millionaires like the sports stars, actors, or musicians, aren’t the ones we should be looking to replicate, but rather these millionaire’s next door. People you might not otherwise suspect, who work in normal (achievable professions) but who have amassed huge savings and investments and have achieved financial independence. Unless you get some sort of lucky break (which is very unlikely) then your path to becoming financially independent is simply through hard work and being smart with your money. You will never “have enough” if you always spend everything you make, but it can be achieved by living below your means. Don’t look to people flashing their wealth but look to smart people pursuing financial independence or freedom. This book runs through debt and minimalism but the real meat of the book is investing with the aim of achieving financial independence. Even if you have no goal of retiring early, these are personal finance principles which we should all be aware of. 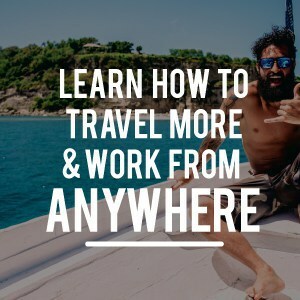 I’m not financially independent, I still have to work to travel the world, both on my blog or for freelance clients. But I did make investments in much the same way as JL advocates here (low-cost index funds that track the market) long before reading his book, so we are pretty much on the same page. Basically, don’t invest in individual stocks (or speculate in Bitcoin for that matter), just invest across the entire market with an index (an ETF, in my case) because the market always goes up over the long-term. Living on less and building a substantial nest egg (while having no debt) is like the greatest relief out there — which is totally what I’ve found to be true. He defines financial independence as when our annual expenses are 4% of our investments, or in other words, 25x our annual expenses. Thus if you need $50,000 per year for your expenses, you will need $1,250,000 invested. Compare that to if you only needed $25,000 per year for your expenses, which means having $625,000 invested. Those all sound like astronomical numbers, but someone earning $50,000 per year for 40 years will earn $2,000,000. It’s just about living on less and investing the rest. 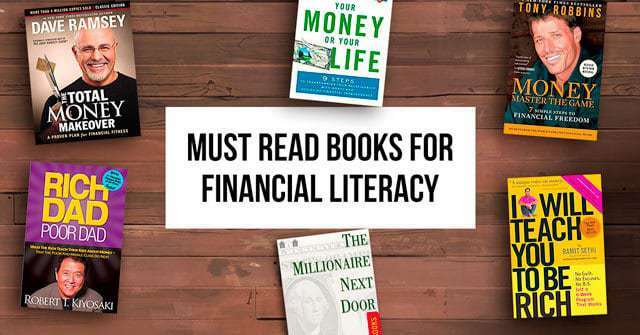 The fact is you could (and probably should) re-read or continue to read financial literacy books for a refresher or to pursue other reading materials as the months and years go on. Becoming financially literate and in control of your money doesn’t necessarily happen overnight, and even if we are on the right track it can be easy to lose sight of our goals and start making dumb financial choices — I know I have. Which is exactly why you should continue to read far and wide. Money: Master the Game by Tony Robbins – Based on interviews with some of the most financially successful investors out there, it covers everything from the psychological hangups we all have with money to how to start investing in the stock market. I hope this article will inspire you to pick up some of these books in order to improve your finances and money situation over the next year. There is truly no step more important, no matter what your future goals may be. Did I leave off any amazingly great financial literacy books? Sound off in the comments below. 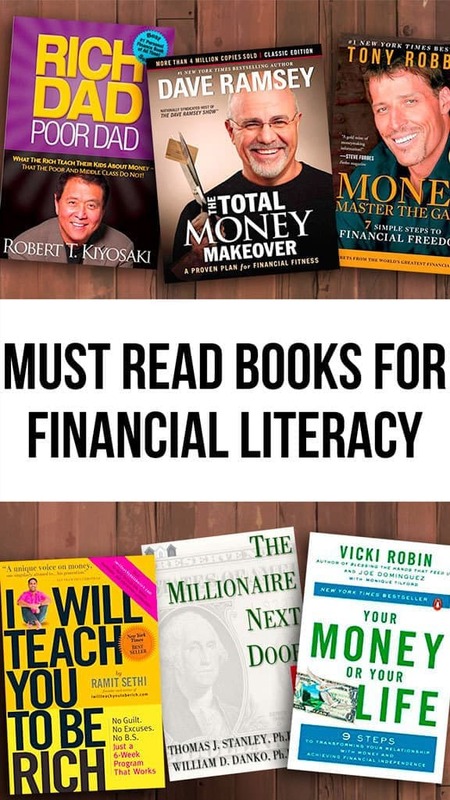 Did you enjoy this post about the best financial literacy books? Please take a moment to share it on Facebook, Twitter, or Pinterest. Good list, I would add Jim Collins’s “The Simple Path To Wealth”. Investing doesn’t have to be hard at all and he does a great job of detailing that. I’ve read three of the four. Your Money or Your Life changed the way I look at both money and work many years ago. The idea that we trade our Life Energy for money via work really grabbed hold of my imagination. I have re-read this book many times over the years and each time I get something new out of it.